All products are letter coded, shrink wrapped and boxed for easy use and storage. Our bingo tickets are the standard border bingo tickets or the larger numbered Jumbo bingo tickets. We sell the full range of bongo books - from 2 games up to 12 games, and also the single flyers. 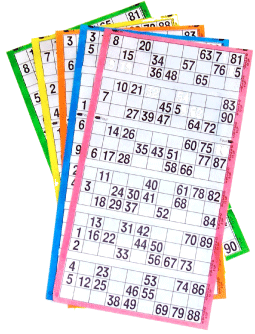 The Jumbo bingo books are supplied 12 in a strip and the bingo flyers come in either 6 or 12 in a strip. They are priced in amounts of 2100 books and the Jumbo bingo books are priced in quantities of 1500. You can buy as many packs as you like or the whole series of 12,000 books. The bingo flyers come in pads of 1800 tickets (12 in a strip). The Jumbo bingo flyers come in pads of either 1200 tickets (12 in a strip) or 600 tickets (6 in a strip). There is a choice of eight colours for both types of flyers. 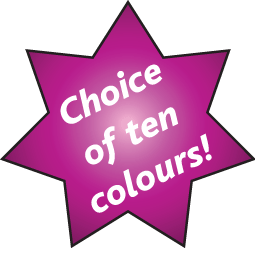 Available plain in 10 colours, 900 bingo tickets in a padded flyer, sold in packs of 12,600 tickets! These are genuine and guaranteed tickets, the pads are glued at the top for easy separation. Each book has 150 pages. Each page has 6 tickets, which are easily separated by a perforation. Bingo tickets with a cover which can be personalised with your club name, numbered consecutively. Single sided booklets available 6 at view or 12 at view.